This is our groups poster we made. 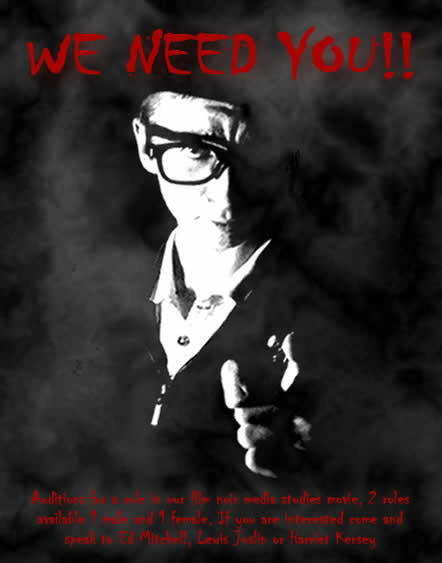 We will be holding auditions for our two lead roles in our movie and so we created a poster using a photograph taken by us and edited in fireworks to advertise the auditions. We used noir characteristics to create the poster such as black smoke, Rembrandt style side lighting, old glasses and hat and chiaroscuro. We chose to use these as our film project is based on film noir and thought this is an eye-catching way to present the opportunity. This is the process we went through in making the poster. We took the original picture of Lewis at school in drama. We used a dark space where we then shone a light onto half of his face copying Rembrandt style side lighting. We then put the picture into black and white and found a smoky black background picture we wanted to use. On fireworks we cut around the figure and copied it onto the smoky background. Then we added text so the audience knew what it was for. We were pleased with the result as it looked attention grabbing and used film noir qualities. This picture was taken by myself and edited by Lewis Joslin and myself. The writing was added on by Lewis Joslin but the overall product was teamwork between the two of us. This clip includes many noir qualities such as a gun fight, icon, dark, alleys, mob, fighting, smoke, death, Rembrandt style side lighting for contrast in good and evil for the character. 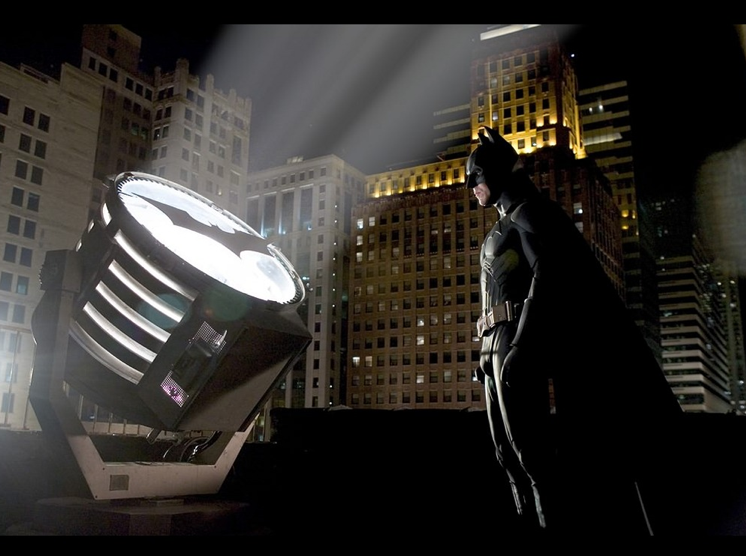 In Batman Begins classic film noir characteristics were challenged and modernized, for example the lighting was in colour as the progression in technology allowed films to be in colour. Most scenes used a dark atmosphere which mirrored the darkness of the plot. Lighting was a big part of this film and uses a contrast in dark and light to show the two different characteristics of the person. 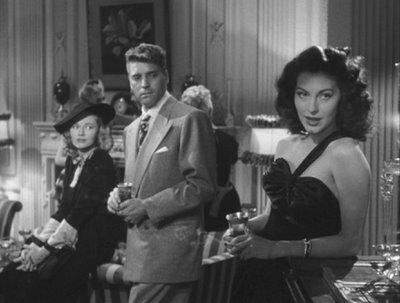 The film also uses some classic qualities of film noir as they use the theme of the dutiful women and use a lot of violence and criminal activity. The setting of the scene was mainly in dark alleys but some omni-scient shots were used of the surroundings giving the audience an idea of the surroudnings. When the scenes gets dark we see the main character getting involved with violent people. The lighting in the film is very dark which mirrors the dark personality of the characters and of the scenes. Batman makes use of many modern noir qualities such as gun fights car chases mob ties and the overall theme of good vs evil. The character in the film is dark and creates enigma as the audience feel like he is reserved and hiding something. This makes the audience want to watch on and find out what happens. Its set in America which is a perfect setting for a gangster style noir to be set. The character has had his parents murdered and we feel like he wants revenge and to defeat the bad men. This is a Neo noir that makes use of some film noir qualities and others are modernised. This is 1/5 noir research that I have done. • Defensive and ready to do whatever it takes at a moment’s notice. • Involved with the wrong kind of people. • Gruesome and violent path. 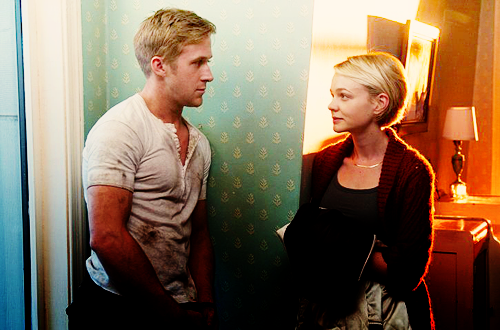 • Relationship with his ‘dutiful woman’ neighbor (Carey Mulligan) and her son. In Drive classic film noir characteristics were challenged and modernized, for example the lighting was in colour which was used as the technology had progressed. In most scenes a dark atmosphere was used to represent the theme of the film and to show the pessimism. A light was used to highlight the characters characteristics and the contrast between light and dark could mirror the two sides of personalities the characters have. The film also uses some classic qualities of film noir as they use the theme of the dutiful women and use a lot of violence and criminal activity. The setting of the scene was split and mirrors the personality of the character as he usually spends time with the family and his lover in the daylight and is a calm guy. But when it gets dark we see him get involved in a dark violent path. The lighting in the film is very dark which mirrors the dark personality of the characters and of the scenes. Some of the scenes are light and this is when he is with his neighbour and we see a softer side of him. 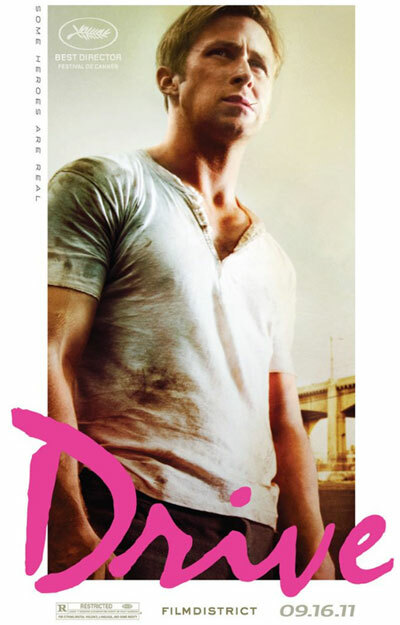 Drive has many car chases and gun fights, the film makes use of many modern noir qualities. The character in the film is dark and creates enigma as the audience feel like he is reserved and hiding something. This makes the audience want to watch on and find out what happens. The theme of this film is noir thriller with some use of violence and criminal activity. Its set in America which is a perfect setting for a gangster style noir to be set. This is 1/5 noir research that I have done. Here is a simple animated storyboard of what our film plot looks like that i made. I included some text so there is a basic structure. This is just a preliminary just our first ideas. 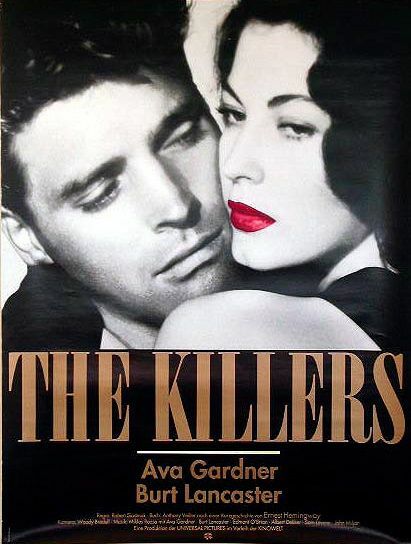 In The Killers classic film noir characteristics were used, for example the black and white was very dark and at the time there was no colour in films which is why black and white was used. In many scenes chiaroscuro was used this is a high contrast in light. This shows the different attitudes in the film and could mirror the main characters personalities. The darkness in the film relate to the pessimism of the time. 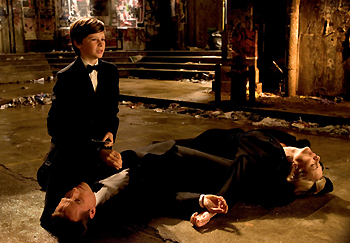 There was use of long shadows to emphasize the enigma in the scene and to highlight the characters importance. The shots are mainly outside in the dark which is a parallel to the dark plot. There is a male voiceover and use of flashbacks in the film which is a common quality of classic film noir films. The voice is of ‘Sam’ one of the characters show what is happening and of the old man as he waits for ‘swede’. The film made use of femme fatale where ‘Kitty’ the beautiful women who make ‘Swede’ fall for her and do exactly what she wants ends up leaving him. Femme fatale is when a woman uses her charm of seduction to make the male do what she wants and then ends in a fatalistic way. The use of old fashioned props were to show the age in which the film was set and by using props such as old cars and old objects relate to the time period of about the 40/50’s when the film was set. Different camera shots were used throughout the film. They use hierarchy of status when Ava Gardner was standing by the piano. She was in the foreground in comparison to ‘Swede’ and ‘Lily’ was in the background showing that kitty had more importance and the fact that ‘Swede’ was staring at her suggests that she is the beautiful unfaithful femme fatale. Omni-scient scenes were used so the audience can see what is going on and can create dramatic irony as the audience know something the characters don’t. However this can also create suspense as in the scene in The Killers where ‘Kitty’ is in the restaurant trying to hide from ‘Sam’, we see an objective shot where we can see everyone. In other shots close ups were used to emphasize the characters expressions and show the audience how they feel. This is 1/5 noir research that I have done. In our group we did some research into what people would think of in a film noir film here are the results..
We asked the following question..
Have you heard about film noir? What aspects come into your mind when we say film noir? What new things would you like to see in a modern noir film? If a new noir was made what genre would you like to see? Would you like to see something different from a noir film, if so, what? What setting would you expect to see in a typical noir film? If you could make up your own plot, what would happen? Using this research we will now pick our plot of the film we will be making. We found out that most of the people we interviewed knew about Film Noir and knew some of the common features of it. They mentioned things like dark alleys and shadows. If a newer film was made the interviewees said that they would like to see some elements of colour and the traditional crime and violence theme running through it. Most also said that if a new noir was made then they would like to see some thriller elements included. This has inspired us to make our film have a thriller theme. Typical settings would be a forest, dark alleys, a mental asylum or a school. We had some great plot ideas such as thriller themes, death, mental asylum, police, murderer, drugs. We found out that most of the people we interviewed were mainly media or drama students who were most likely to have a few ideas about Film Noir. Taking this into consideration we have decided to make a genre hybrid by mixing the theme of Film Noir with Thriller to appeal to a wider audience and taking our audience research on board. Questions by Ed Mitchell, Lewis Joslin and Myself and the film was made and filmed by Harriet Kersey and Lewis Joslin.